With Valentine's Day fast approaching, why not consider giving a non-candy gift to your daughter, granddaughter or special young girl in your life. I don't know about you, but my girls are still coming off a sugar high from all the candy Santa left for them in their stockings, so I for one, will be giving them non-candy gifts for Valentine's Day from Cupid. 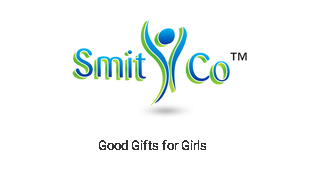 Recently I stumbled upon an amazing company called SmitCo LLC, which offers a wonderful selection of gifts for girls. From girly girl dress up sets and accessories to diaries and even glitter tattoo and scented nail sets, you are bound to find the perfect gift to surprise that special girl in your life. I was recently sent their Secret message Set, which is a diary that you gain access to by pushing buttons on the passcode lock to open. 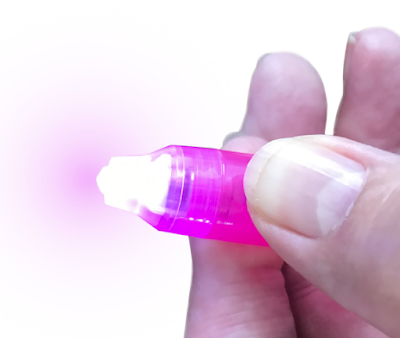 If this cool feature wasn't enough to get girls excited about journaling or writing in their diaries, this diary also comes with a 2 in 1 message pen. Girls can write a secret message with the special invisible ink pen and then shine the blue light over the writing to make it appear. My daughter, Bella thought this was so cool. 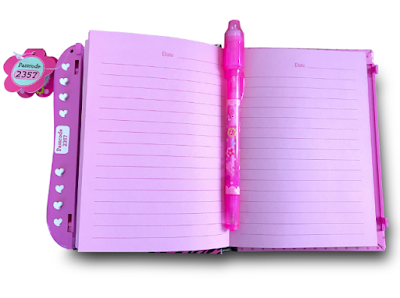 I remember having a diary as a kid, and love being able to share a diary with my girls, which they can use to practice their writing, draw pictures, make wish lists, etc. The sky is the limit as to what they will fill the pages of their special secret message diary from SmitCo LLC. I love watching them sit at the table writing secret messages for each other, and strengthening that sisterly bond. There are days they fight nonstop over silly things, but then there are days like when we received this girls diary with lock, that they sat together and played nice. And, now they love writing special notes or drawings and passing them to one another, so that my husband and I can't see what special messages they are sending. I did intercept one message and it was a big heart with "I Love You!" written in the middle. My heart melted seeing the girls share special loving messages like this with one another. So, with Valentine's Day right around the corner, why not skip the candy aisle and head on over to SmitCo LCC. to check out their wonderful and oh so affordable line of gift sets and special gifts just for girls. The secret diary we were sent is only $22.99, which if you ask me is a steal for what you get -- a 2 in 1 secret message pen and journal with passcode lock. But, in the meantime, head on over to https://www.smitcollc.com and check out their gifts for girls for Valentine's Day, an upcoming birthday gift idea or "just because" gift to brighten up their day. Once you check out their product offering, you will see why I love the products from SmitCo LLC and stop raving about the online store to family and friends, and will be making upcoming Easter and birthday purchases there.